Are your nails jammin yet?! If they are not, let me introduce you to this cool trend for glamorous nails- Jamberry nail wraps. 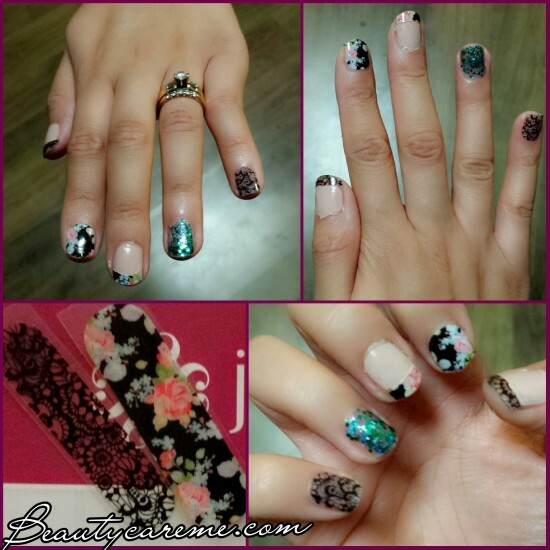 Nail wraps have been a huge trend these past years, mostly because they offer the commodity of getting cool designs on your nails right at home, and they are less expensive than going to your local nail salon. But what makes Jamberry nail wraps so special? Keep reading for a review on application, overall product and a video demo for accurate application of the wraps. I first heard about Jamberry nail wraps through a Facebook party hosted by one of my friends. The Jamberry consultant, Theresa, was very informative and kept the virtual party interesting with contests and lots of pictures of various designs offered by Jamberry. If you want to learn more about hosting your own Jamberry party or becoming a consultant, contact Theresa here. I loved the designs! They look very fashionable and definitely don’t look like stick-ons. As far as appearance, I’d say Jamberry knows what they’re doing. The designs are very nice, and the selection is great to satisfy different tastes. The application process looked pretty simple, but be warned follow everything by the book to be sure your wraps last a week or two and don’t fall off sooner. The video below is a great tool for those of you who are visual learners. I also included step by step application if that’s more your style. You get to change the design on your nails to match your mood, or event you’ll be attending. One sheet of nail wraps will last you a few uses, so it’s definitely less expensive than going to the nail salon. If you know what you’re doing, application time is pretty quick. The application process might be a little tricky for some. As mentioned don’t rush your first time, and check out the demo video before trying it out. This might not necessarily be a con of the product, but you don’t get that salon experience. Some women like getting pampered or planning a salon trip with their friends. Overall, I’m pretty happy I got the opportunity to learn about Jamberry nail wraps and try them out for myself. They are definitely worth buying if you are the type of girl who loves changing up her nail color/design, and are open to saving money by skipping salon visits.